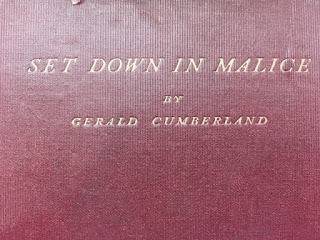 Set Down In Malice by Gerald Cumberland, published one hundred years ago in January 1919, is a book of chatty anecdotes about literary, musical and artistic figures, amongst others. It was mostly written, says the author, while on “Active Service in the Near East”; “in the trenches and dug-outs of Greece and Serbia”, and he “added a chapter or two in Port Said, Alexandria and Marseilles”. ‘Cumberland’ was in fact Charles Francis Kenyon (1879-1926), a music critic and minor composer, and the author of “an experiment in the sensational”, The Cypress Chest, a macabre thriller. He gives a sympathetic but shrewd description of John Masefield: “I believe he is intensely morbid, delighting to brood over dark things, seeing no humour in life, but full of a baffled chivalry . . .” The poet was indeed drawn to the macabre, an enthusiast of Machen and M R James, though himself gentle and rather shy. We are also given an amusing story of the author’s friend Granville Bantock, accompanied to a music festival by two live eels, ‘dark objects in dark water, swirling about with enormous enthusiasm’ in a tank in the composer’s hotel room . . . But Cumberland does not only write about the celebrated. He tells also, for example, of forgotten bohemians, Café Royal habitués, such as a Polish poet who had a dispatch case containing eight hundred and seventy-three poems all about himself. Cumberland read one, entitled ‘How I felt at 8.45 A.M. on June 8, 1909, having partaken of Breakfast’, and thought it “much better than half of Wordsworth’s”. There was also a lady “who used always to appear in public in a kind of purple shroud, her face and fingers chalked. She rather stupidly called herself Cheerio Death . . .” and in fact, he says, died of consumption in Soho in the Autumn of 1913. Charles Marriott (1869-1957) was from 1924-40 the art critic of The Times and wrote books on art. His Love With Honour (1902) is an Edwardian vagabonding novel: a young man, the orphaned son of a parson, on attaining his majority throws up photography indentures and takes to the road. 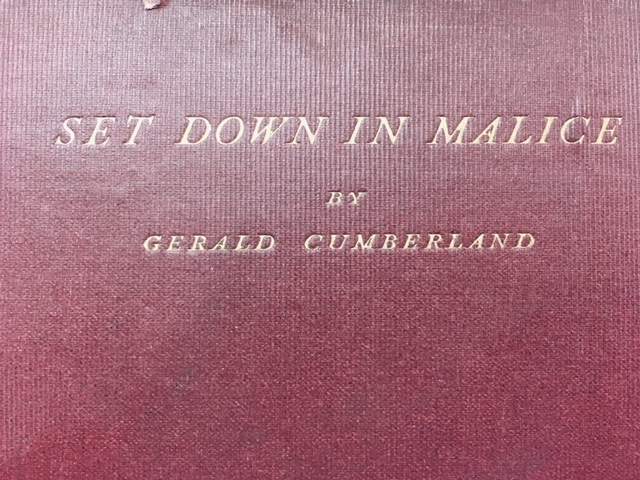 There is a passage about the effects of hunger and weariness - light-headedness and disconnection with the world - that is similar to some of Machen’s, and there are some lyrical segments, but the novel soon veers into a conventional romance. His other novels appear to be mostly rather decorous accounts of romantic couples who have to overcome social or emotional difficulties, though “Now!” (1910) is a near-future fantasy in which people adopt a quietist lifestyle. Marriott is a good character-drawer - his minor characters are well done - but a certain amount of intensity is missing, things are a bit too well-staged. Two other writers mentioned by Cumberland I did not know at all. Alphonse Courlander was, he says, “one of the many young and promising writers whom the war has killed”: not, it seems, at the front, but from overwork. He was a restless journalist in France, “and the horror of the war appears to have got on his nerves. He disappeared from Paris and was found wandering alone in London, neurasthenic, beaten, purposeless. A week or two later he died.” Cumberland’s impression is that “he was too highly strung for the rigours of the game.” Courlander, says Cumberland, used to ask his friends for plots. His Mightier Than the Sword (1912), however, about the picaresque progress of a journalist, seems to have autobiographical elements. The other writer, with whom Cumberland corresponded, but never met, was Benjamin Swift. “Many of us will remember,” he says,“Benjamin Swift’s Nancy Noon, a strange novel that jerked the literary world into excitement two decades ago”. But Swift, like Marriott, did not later meet this anticipation. “I remember six or eight of his books,” continues Cumberland, “each lit with genius, but all a little crude and violent.” And, though he has not read his more recent books, he hears they also are “outré, violent, eruptive, yet distinguished and glowing here and there with a genius that is always hectic.” I must admit these Shielian adjectives make Swift sound rather tempting. I just finished reading your book, "Haunted By Books," and enjoyed it a great deal. And here, once again, you introduce us to yet another intriguing writer from yesteryear. Thanks for this. I value your expertise and passion for the nearly forgotten writers who deserve not to fade into obscurity. Benjamin Swift was the pseudonym of the Glasgow-born William Romaine Paterson (1871-1942). The University of Glasgow holds his papers. He published quite a lot, at least 15 novels and a number of non-fiction and essayistic books. His novel The Tormentor is accessible at the Internet Archive. I think that I will give The Tormentor a go myself. It is amazing to think that there could be a prolific novelist from this relatively recent period who is so far under the radar that even you, sir, an expert in this area, had not heard of him. Discovery never ends. Your blog is fantastic, by the way. I mean, when Michael Dirda is one of your loyal readers, you are doing sonething right!